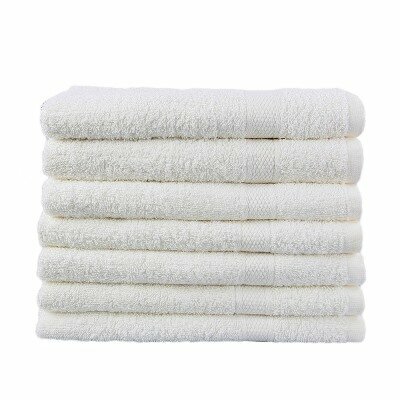 At Towel Super Center, we provide you the option to buy premium white towels at wholesale value. With 24” by 50” dimensions that make them the perfect fit for wrapping your entire body, you’ll want to stock up on these towels to line your shelves. Why Choose Our Standard Premium White Bath Towels? Simplicity: Don’t confuse simplicity with monotony. White bath towels bring out a beautiful sense of classy décor met to fulfill your commercial and home towel needs. An alternative to vibrant and darker colors, white towels supply a trendy addition to its contemporary surroundings. White also provides a level of chic and professional quality. Whether they’re folded neatly in your personal bathroom or strung along the bathroom of your hotel, premium blend bath towels provide a glistening and professional look due to their simple yet clean-appearing nature. Flexibility: As a standard white color, our premium blend bath towels match whatever possible color scheme your company may have. Whether your wallpaper and furniture hosts an eclectic array of colors or you have a monochromatic arrangement, white towels fit excellently with your preexisting accessories. Are you looking to buy towels in bulk that will last in strength and style? Our premium white bath towels don’t just retain their durability — they also retain their stylishness. Whenever you renovate your interior designs, your white bath towels will remain a perfect addition to your home or business. Color Maintenance: You’ll never have to worry about pesky stains or discoloration. Made from 14% polyester and 86% cotton, these poly-blends are apt to handle bleaching agents and alternatives. You’ll never lose the lustering shiny-white appearance your towels emitted when first opened from the box. They retain their color so you can maintain a nice polished image wherever you hang them. At Towel Super Center, our towels are constructed with superior fabrics to ensure a quality product for the consumer. Our poly-cotton blend material ensures a sparkly white color even after continual wash. Retaining the fresh color won’t take much effort on your end — our towels are made from a durable material designed to withstand the washing required to launder off stains. If you notice any apparent stains or dirt on your premium blend white towels, merely pop them in the wash for a normal rinsing. If laundering isn’t enough to remove stains, add some bleach to your next wash to ensure optimal whiteness. With the versatility provided by our premium bath towels, you’ll benefit from buying them at wholesale prices at Towel Super Center. Are you looking for towels in various sizes, materials, or colors? If you’d like to couple your premium towel purchase with varying other options, we offer a variety of towels designed to suit your needs. Order your towels in bulk today to bring yourself one step closer to furnishing your home or business with the towels you and your customers deserve.